GIA studied more than 400 important gemstones from the Gübelin Collection and is committed to sharing this repository of gemological information. This work is a valuable resource for all students, gemologists and researchers. Chemically pure beryl is colorless, but trace elements give rise to green, blue and pink/red colors. 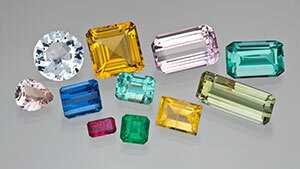 The most important variety is green emerald (colored by chromium or vanadium), followed by blue aquamarine and yellow heliodor (both colored by iron) and pink morganite (colored by manganese). Some beryls fashioned as cabochons exhibit asterism (a star-shaped pattern of reflections) or chatoyancy (a “cat’s-eye” seen in reflected light). Ruby and sapphire (usually blue, but also in every other color) have been the most important colored gemstones for several thousand years. Originating historically in southeast and central Asia, and more recently in eastern Africa, these colored varieties of the mineral corundum have been much sought as gems because of their rarity, color and durability. Gem corundum can display asterism and chatoyancy due to the presence of oriented mineral inclusions, and in some cases, a change of color when viewed under different light sources. Often thought of as a deep red gemstone, garnet can also be yellow, orange, green or brown – any color except blue. There are six common garnet minerals – almandine, andradite, grossular, pyrope, spessartine and uvarovite – and several rare species. 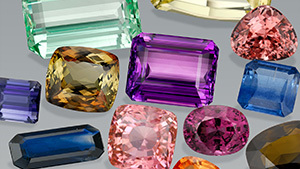 Gem varieties include green demantoid and tsavorite, orangy red hessonite and pink/red rhodolite. Besides brilliance and attractive colors, garnets sometimes exhibit optical phenomena such as asterism (a star-shaped pattern of reflections), chatoyancy (a “cat’s-eye” seen in reflected light), or a color change when viewed under different types of lighting. 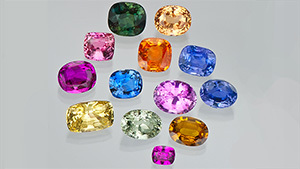 Found in nearly every color – most notably red, pink and blue – spinels are popular gemstones because of their abundance, moderate cost and attractiveness. Red spinel has often been mistaken for ruby. 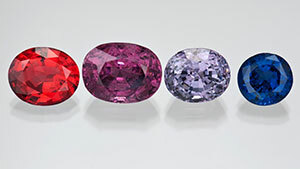 Some spinel exhibits asterism (a star-shaped pattern of reflections), chatoyancy (a “cat’s-eye” effect seen in reflected light) or a color change when viewed alternately under incandescent and fluorescent lighting. Tourmalines have a very complex chemical composition, and more than a dozen mineral species are recognized within this group. Their highly variable chemical composition gives rise to a wide range of colors. Among the many varieties of elbaite tourmaline are verdelite (green), indicolite (blue) and rubellite (red). Some tourmaline specimens display multiple colors. Optical effects include pleochroism (a change of color when the gemstone is rotated) and chatoyancy (a “cat’s-eye” seen in reflected light). 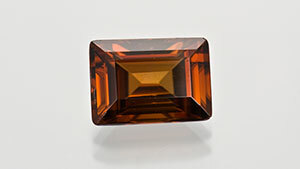 Although colorless when chemically pure, zircon is typically yellow-brown to brown. It also comes in red, blue, purple, and green. Because of its high brilliance and dispersion, colorless zircon has sometimes been used as a substitute for diamond in jewelry. Among the collection assembled by Dr. Edward Gübelin are a number of uncommon gemstones from many worldwide localities. Documents for these gems present information on gemstones that range from occasional use in jewelry to those that are quite rare and seldom faceted because of the lack of suitable starting material.